At last, Room 10 is open for use. Friday’s ribbon cutting ceremony marked the culmination of months of planning and purchasing and imagining. Designed by students, this collaborative learning space features many of the aesthetics we know promote a sense of community and calm. How do we know this? We learned it from our students. 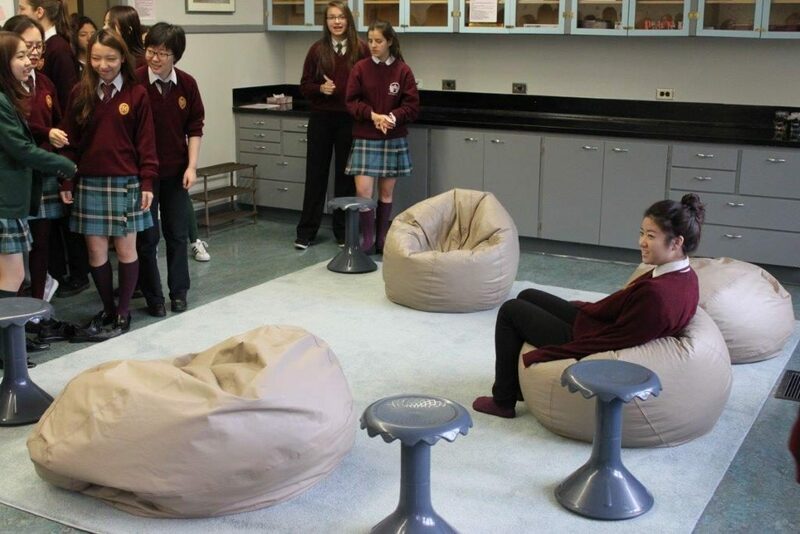 Last year students and teachers identified the need for an additional space in Senior School for students to relax in and for teachers to be able to teach from. 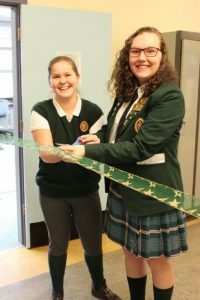 Student teams from each grade were asked to submit a proposal to redesign a central classroom in the school and in September a “Dragon’s Den” competition took place to determine which proposal would go forward. The final selection included elements from many of the proposals. A common theme of each was the need to have a room that welcomed all guests with soft furnishings, muted colours, indirect lighting and space for expression. The students researched what was needed to create such a space with a budget of $11,000, a generous donation from one of our alumni families. Students learned about design principles, implications of purchasing materials locally vs. internationally, how to reach consensus when points of view differed…and they did… and how to follow through with an idea from the first brainstorm to the finished product. The results of their design efforts are available to all members of our learning community from this week forward. Now that the room is in place and everyone can access it, the shift in focus has been to caring for the space and engaging the community to develop rules for its use. Prefects and Student Council have canvassed the students for ideas and the final rules are very simple….respect others, clean up after yourself, and be inclusive. Over 100 students contributed to the Room 10 project. Amid their lessons, activities, and jobs they chose to make an investment of time and thought and in some cases significant action for the benefit of their community. We thank them all.